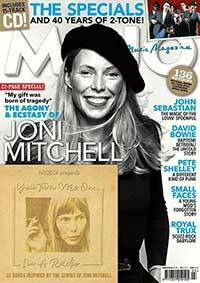 The upcoming March issue MOJO magazine celebrates Joni over 22 pages, with a classic in-depth interview, plus rare pics and insights and a 15-track CD of Joni songs and artists, featuring Julia Holter, Frazey Ford, Nadia Reid, Case/Lang/Veirs, Sun Kil Moon, Tomberlin, Wendy & Lisa and more. Pick one up in your local bookstore or get a copy delivered to your home. In celebration of Joni’s 75th birthday, an amazing group of artists joined together for a tribute concert, in front of Joni herself. On Feb 7 only, you can experience the incredible concert on the big screen alongside fellow Joni fans when @MusicCenterLA Presents Joni 75: A Birthday Celebration comes to movie theaters across the US and Canada. Info and tickets here. Rhino Records will be releasing Joni's album "Blue" on... you guessed it... blue vinyl on January 22. Limited to 6,000 copies! More information here. The 120-minute 'Joni 75' performance will show one night only - February 7 - in 350-400 theaters across the USA. Details are sketchy but we'll post more here as they come to light. Norman Seeff's long-awaited book, the extraordinary collection of photographs entitled "Joni: The Joni Mitchell Sessions" is being shipped this week. It is a creative partnership that has lasted for over 40 years. Joni and Norman Seeff, a rock-and-roll photographer with a host of legendary subjects in his portfolio, did some of their best work together. Through over a dozen sessions with Joni, Norman captured the many facets of her personality in some of her most famous images. -Password protected access to Seeff’s library of filmed sessions featuring multiple artists exploring Joni as the Boundary Dweller and innovative Artist. -Seeff’s 7-Stage road map of the Boundary Dweller Archetype as exemplified by Joni. This schematic serves as a tool to empower personal creativity. The standard edition, without any of the above features, is available through Amazon and other booksellers starting on December 18th. 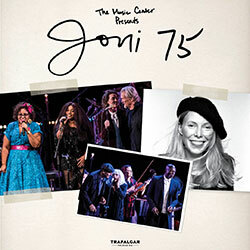 The beautiful program book for the Joni 75 event in Los Angeles has been put online. If you didn't get a ticket, you can at least enjoy the booklet! Take a look. The beautiful 11x14 inch hardcover version of Norman Seeff's book, currently available for pre-orders at $60, will increase to the retail price of $75 on October 24. The signed version will remain at $100 & the Collectors Edition at $650 and Seeff will add a personalized greeting for those who order either of these versions via the website and provide the name(s) for the greeting. 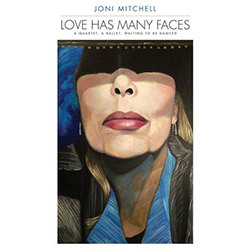 For all you completists out there, Joni's most recent compilation "Love Has Many Faces: A Quartet, A Ballet, Waiting To Be Danced" is being released as a 180-gram 8LP vinyl box set. See more information here. The Music Center has added James Taylor and Brandi Carlile to the previously announced line-up of singers and musicians who will honor Joni Mitchell on her 75th birthday as part of JONI 75: A Birthday Celebration Live at the Dorothy Chandler Pavilion on November 6 and 7. A limited number of additional tickets have been released and are going fast. James Taylor and Brandi Carlile will join Glen Hansard, Emmylou Harris, Norah Jones, Chaka Khan, Diana Krall, Kris Kristofferson, Los Lobos, Graham Nash, Seal, and Rufus Wainwright to perform songs from Mitchell’s prolific career. Co-musical directors providing the musical arrangements for the evenings are drummer Brian Blade, who recorded three studio albums and toured extensively with Mitchell, and, pianist, composer, arranger producer Jon Cowherd. We are currently accepting submissions for symposium speaker proposals. The committee hopes that Mitchell's evocative lyrics inspire a similarly wide-ranging set of proposals. For more information, see the Call for Papers. Max Bennett's first professional gig was in 1949, and throughout his long career he played with such legends as Peggy Lee, Ella Fitzgerald, Frank Zappa, Frank Sinatra, Ray Charles, Marvin Gaye, George Harrison, Joan Baez, Joni, and many more. Max is often associated with the famous 'Wrecking Crew', a loose collective of session musicians based in Los Angeles whose services were employed for thousands of studio recordings in the 1960s and early 1970s. In 1973, Bennett, along with Tom Scott, founded the L.A. Express which served as the core band for Joni's Court and Spark album. A subsequent iteration of the group backed Joni on her 1974 tour which spawned the live Miles of Aisles album. 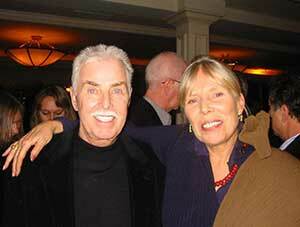 Max states on his website: "I feel that the relationship with Joni was the pinnacle of great music and total fun! She is a great lady!" Max was also interviewed for JoniMitchell.com in 2011 where he talked more about his time recording and touring with Joni. Max Bennett was 90 years old. Our thoughts go out to his friends and family. 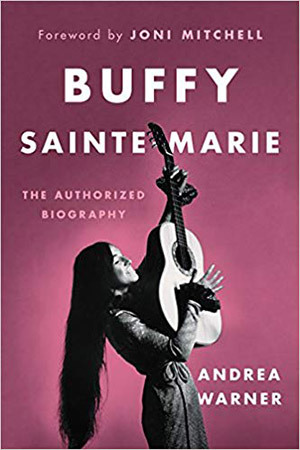 Buffy Sainte-Marie: The Authorized Biography will be released on September 25. "Folk hero. Songwriter icon. Living legend. Buffy Sainte-Marie is all of these things and more. In this, Sainte-Marie's first and only authorized biography, music critic Andrea Warner draws from more than sixty hours of exclusive interviews to offer a powerful, intimate look at the life of the beloved artist and everything that she has accomplished in her seventy-seven years (and counting)." Joni has written the Foreword for the book, saying "whenever Buffy came to town I went down to the coffee house to hear her play. Her songs were so smart, so well-crafted, and her performances were stunning." 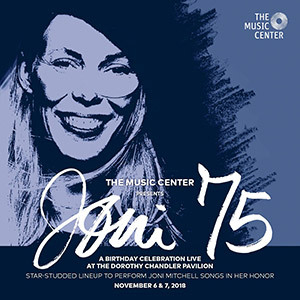 Today The Music Center announces two star-studded concerts, JONI 75: A Birthday Celebration Live at the Dorothy Chandler Pavilion on November 6 and November 7, 2018, featuring an incredible array of singers and musicians who will honor one of the world’s most remarkable artists, Joni Mitchell, on her 75th birthday. 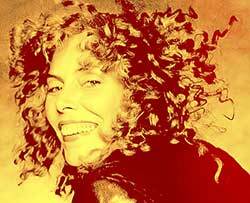 On both nights, Glen Hansard, Emmylou Harris, Norah Jones, Chaka Khan, Diana Krall, Kris Kristofferson, Los Lobos, Graham Nash, Seal, and Rufus Wainwright, will perform songs from all stages of Mitchell’s life and career, across the entire oeuvre of her 19 studio albums. Co-musical directors, providing the musical arrangements for the evenings, are percussionist Brian Blade and pianist, composer, arranger, producer Jon Cowherd. Buy tickets now. 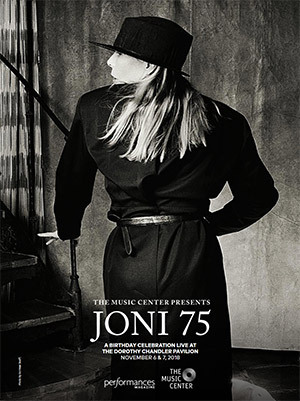 Following the second concert, on November 7, 2018, The Music Center will salute Mitchell on her birthday with The Music Center’s Soirée: JONI 75, a special celebration for her and a fundraiser for The Music Center’s artistic programming. Rolling Stone reports that "live performances by Neil Young and Joni Mitchell, recorded at a student ministry on the University of Michigan campus in 1968, were among the professional-quality recordings unearthed by the Michigan History Project. "Seven-inch reel-to-reel audio tapes featuring concerts by Tim Buckley, Odetta, David Ackles and Dave Van Ronk were also among the recordings made at the Canterbury House, an Ann Arbor, Michigan venue that hosted counterculture events in the mid to late-Sixties. 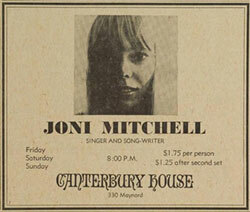 Joni performed at the Canterbury House on March 8, 9, and 10 in 1968. It's unclear as to which concert(s) have been found. Before the weekend of performances, someone scrawled across the advertisement "God is alive in Joni Mitchell". "The Michigan History Project recently acquired the recordings, with the non-profit organization now seeking a record label interested in releasing the concerts." Hot Docs Ted Rogers Cinema in Toronto will feature a 6-part lecture series on Joni. Dr. Mike Daley tells Joni’s story in detail, exploring her Alberta and Saskatchewan upbringing, her early years in Toronto's burgeoning folk scene, her musical partnerships, and the romantic affairs and marriages that inspired some of her unforgettable compositions. He’ll examine the fascinating life and career of a Canadian icon. Led by Dr. Mike Daley (Leonard Cohen: Words and Music, The Beatles and their World, Bob Dylan: Words and Music), a music historian and professional musician who has taught at Guelph, McMaster, Waterloo and York Universities. In 1970 the Isle of Wight Festival was one of the largest musical events of its time. Bigger than Woodstock, and controversial from the get-go, hundreds of thousands of people descended on the island. Many of those without tickets set up camp on a hill overlooking the festival site, opposing the consumerism of the event and intent on taking the music back by any means necessary. It was a celebration of hippy counter culture gone awry, and in Joni's words "they fed me to the beast". 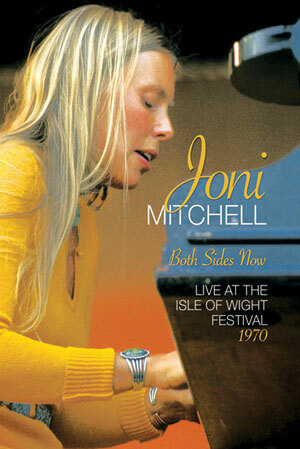 Joni took to the stage to deliver an outstanding performance against all odds. At times it was a battle against the audience, as they tore down barriers and shouted obscenities. Her set was interrupted multiple times, including one man invading the stage to try address the crowd. 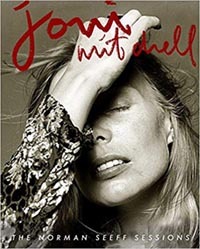 'Joni Mitchell: The Norman Seeff Sessions' is a new photo book to be published on November 6. Timed to release on Joni's 75th birthday, this collection of familiar and rare imagery tracks the pair's history together through these exclusive moments captured on film. A combination of album artwork and candid shots reveals Joni's personality in ways few have managed to capture before or since. Featuring commentary from Seeff on the enlightenment into his art that he gained from their sessions, this compilation is a true reflection on mutual creativity between artist and muse.